Phishing is a type of social engineering attack often used to steal user data, including login credentials and credit card numbers. It occurs when an attacker, masquerading as a trusted entity, dupes a victim into opening an email, instant message, or text message. The recipient is then tricked into clicking a malicious link, which can lead to the installation of malware, the freezing of the system as part of a ransomware attack or the revealing of sensitive information. An attack can have devastating results. For individuals, this includes unauthorized purchases, the stealing of funds, or identify theft. Moreover, phishing is often used to gain a foothold in corporate or governmental networks as a part of a larger attack, such as an advanced persistent threat (APT) event. In this latter scenario, employees are compromised in order to bypass security perimeters, distribute malware inside a closed environment, or gain privileged access to secured data. An organization succumbing to such an attack typically sustains severe financial losses in addition to declining market share, reputation, and consumer trust. Depending on scope, a phishing attempt might escalate into a security incident from which a business will have a difficult time recovering. A spoofed email ostensibly from myuniversity.edu is mass-distributed to as many faculty members as possible. The email claims that the user’s password is about to expire. 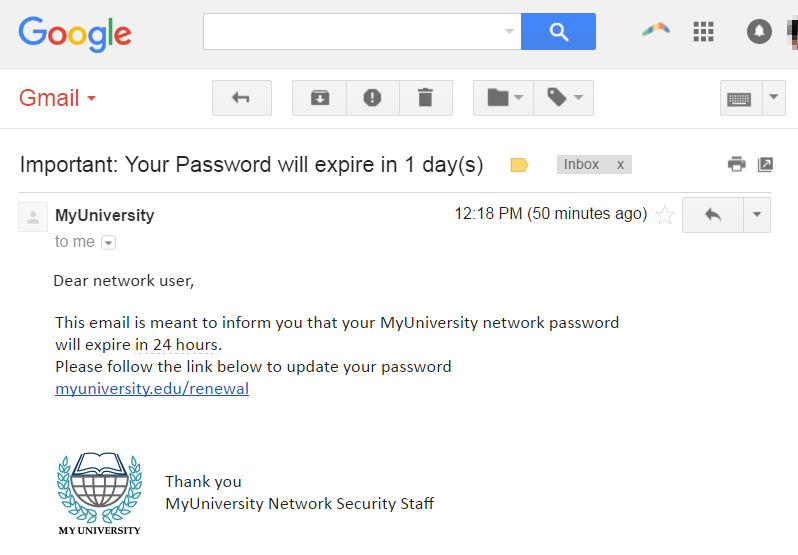 Instructions are given to go to myuniversity.edu/renewal to renew their password within 24 hours. The user is redirected to myuniversity.edurenewal.com, a bogus page appearing exactly like the real renewal page, where both new and existing passwords are requested. The attacker, monitoring the page, hijacks the original password to gain access to secured areas on the university network. The user is sent to the actual password renewal page. However, while being redirected, a malicious script activates in the background to hijack the user’s session cookie. This results in a reflected XSS attack, giving the perpetrator privileged access to the university network. Email phishing is a numbers game. An attacker sending out thousands of fraudulent messages can net significant information and sums of money, even if only a small percentage of recipients fall for the scam. As seen above, there are some techniques attackers use to increase their success rates. For one, they will go to great lengths in designing phishing messages to mimic actual emails from a spoofed organization. Using the same phrasing, typefaces, logos, and signatures makes the messages appear legitimate. In addition, attackers will usually try to push users into action by creating a sense of urgency. For example, as previously shown, an email could threaten account expiration and place the recipient on a timer. Applying such pressure causes the user to be less diligent and more prone to error. Lastly, links inside messages resemble their legitimate counterparts, but typically have a misspelled domain name or extra subdomains. In the above example, the myuniversity.edu/renewal URL was changed to myuniversity.edurenewal.com. Similarities between the two addresses offer the impression of a secure link, making the recipient less aware that an attack is taking place. Spear phishing targets a specific person or enterprise, as opposed to random application users. It’s a more in depth version of phishing that requires special knowledge about an organization, including its power structure. A perpetrator researches names of employees within an organization’s marketing department and gains access to the latest project invoices. Posing as the marketing director, the attacker emails a departmental project manager (PM) using a subject line that reads, Updated invoice for Q3 campaigns. The text, style, and included logo duplicate the organization’s standard email template. A link in the email redirects to a password-protected internal document, which is in actuality a spoofed version of a stolen invoice. The PM is requested to log in to view the document. The attacker steals his credentials, gaining full access to sensitive areas within the organization’s network. By providing an attacker with valid login credentials, spear phishing is an effective method for executing the first stage of an APT. Phishing attack protection requires steps be taken by both users and enterprises. For users, vigilance is key. A spoofed message often contains subtle mistakes that expose its true identity. These can include spelling mistakes or changes to domain names, as seen in the earlier URL example. Users should also stop and think about why they’re even receiving such an email. Two-factor authentication (2FA) is the most effective method for countering phishing attacks, as it adds an extra verification layer when logging in to sensitive applications. 2FA relies on users having two things: something they know, such as a password and user name, and something they have, such as their smartphones. Even when employees are compromised, 2FA prevents the use of their compromised credentials, since these alone are insufficient to gain entry. In addition to using 2FA, organizations should enforce strict password managment policies. For example, employees should be required to frequently change their passwords and to not be allowed to reuse password for multiple applications. Educational campaigns can also help diminish the threat of phishing attacks by enforcing secure practices, such as not clicking on extrenal email links. Imperva Login Protect lets you deploy 2FA protection for URL addresses in your website or web application. This includes addresses having URL parameters or AJAX pages, where 2FA protection is normally harder to implement. The solution can be deployed in seconds with just a few clicks of a mouse. It doesn’t require any hardware or software installation and enables easy management of user roles and privileges directly from your Imperva dashboard. Working within the cloud, Imperva Web Application Firewall (WAF) blocks malicious requests at the edge of your network. This includes preventing malware injection attempts by compromised insiders in addition to reflected XSS attacks deriving from a phishing episode.